The Santa Clarita Valley (SCV) VegFest, is proud to announce the national nonprofit organization The Gentle Barn, as their new presenting sponsor. In addition, organizers of Santa Clarita’s first-ever vegan festival, have also announced that 20% of the proceeds from the one-day outdoor festival will benefit Kakao, Charity Water and local nonprofit organizations Bridge to Home and Family Promise. 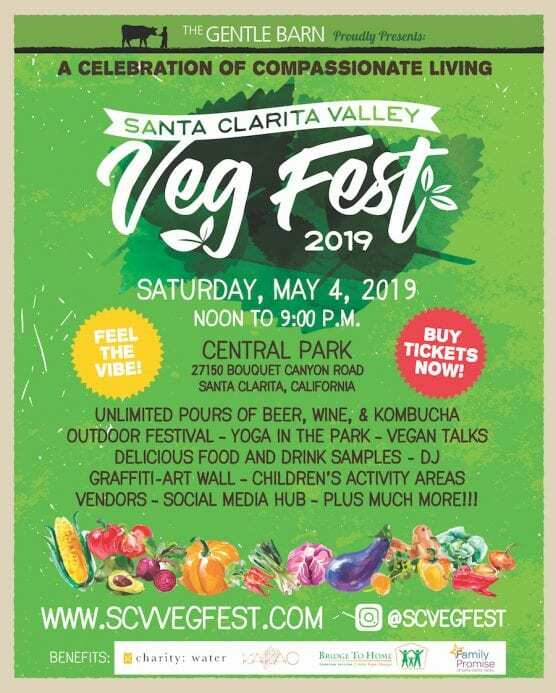 The festival is set to sprout in Santa Clarita on Saturday, May 4, 2019 from noon to 9:00 p.m. in Central Park, located at 27150 Bouquet Canyon Road.